Did you encounter an objectionable site unintentionally? 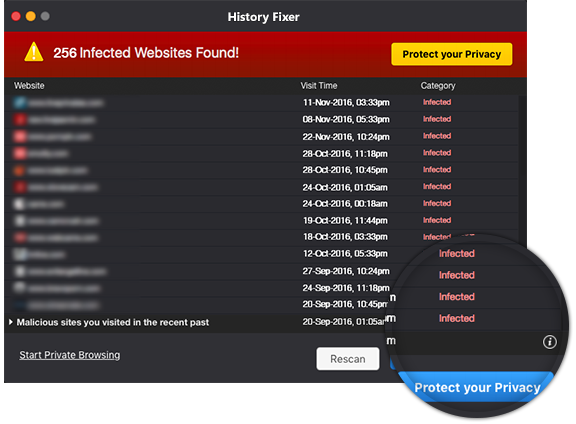 Get this easy solution to get rid of the infected traces. History Fixer is a secure solution for your Mac that erases the traces of undesirable website visits in the past. 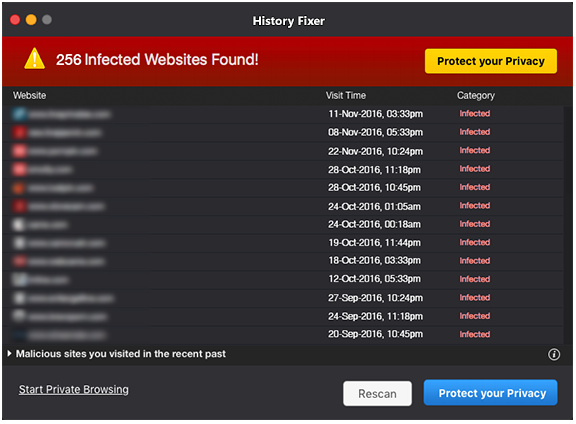 Are you experiencing non-essential traces of infected sites on your Mac? If yes, your Mac is not safe then because it may turn up into an embarrassing situation for you; in case someone peeps into your Mac. Erasing these traces from your Mac would definitely save you from any privacy issues. This is one easy way to assist you in deleting all traces of objectionable sites that you have unwillingly or accidently visited. It checks for infected traces in all major browsers like Safari, Chrome, Firefox so that your Mac’s protection is right there. Designed for comfortable usage experience, History Fixer is easy to operate with instant removal of unwanted traces in just one click. With its Private Browsing mode, your privacy is kept intact as it never saves your browsing traces and your surfing can’t be tracked in there. It was difficult to remove all these offensive site traces completely without leaving behind any remnants. But it became viable and quick.